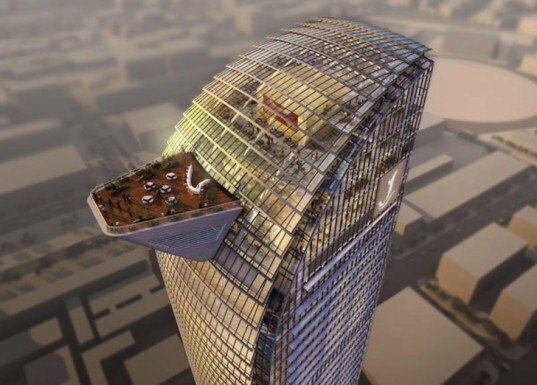 Phnom Penh's new Vattanic Capital Tower will be the tallest building in Cambodia's capital city. Nestled in the heart of the city's emerging business and financial district, the new office space and banking headquarters will house the country's first stock exchange. The project, designed by TFP Farrells, aims to provide Phnom Penh with a distinctive high-rise building that has a unique cultural presence -- the shape evokes images of a dragon’s back, symbolizing good luck and wealth. 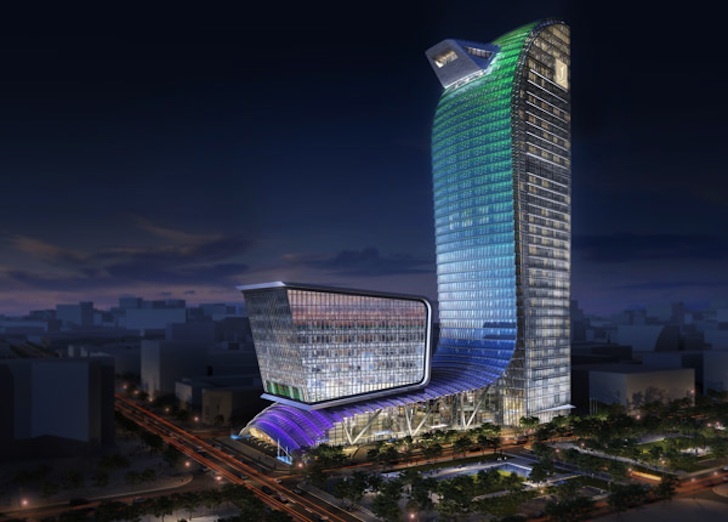 The building will be LEED certified, and it consists of two towers and a glass and steel podium. Tower 1 will hold world-class offices, luxury retail, as well as studios, 1-bedroom, and 2-bedroom serviced apartments. Tower 2 is a floating office with tall ceilings and raised floors to accommodate the country’s first stock exchange. The podium has three floors designated for retail, cafes, restaurants, and luxury boutiques. Thirty two retailers will set up shop to provide the business community with a high-class shopping experience. A cantilevered roof lets light filter through the dragon-like scales or glass spandrels of the underlying structure, and looking through the towering glass facade affords insiders expansive views of the Tonle Sap and Mekong Rivers. The development is centrally located with excellent transportation connections — a good thing, since there are less than four hundred available parking spaces. Lighting will be optimized at 400 lux – the same amount of light as a sunrise or sunset on a clear day, and air will be conditioned through a central chiller VAV system, which could be modeled to provide energy savings of 10% to 20% of HVAC energy costs. The building will be secured with card access, advanced CCTV, and turnstile control. An exterior curtain wall will be constructed with low-energy insulated glazing for additional efficiency and interior climate preservation. The Vattanic Capital Tower is currently under construction and will be completed this year. The building will be LEED certified, and it consists of two towers and a glass and steel podium. Tower 1 will hold world-class offices, luxury retail, as well as studios, 1-bedroom, and 2-bedroom serviced apartments. Tower 2 is a floating office with tall ceilings and raised floors to accommodate the country's first stock exchange. The podium has three floors designated for retail, cafes, restaurants, and luxury boutiques. Thirty two retailers will set up shop to provide the business community with a high-class shopping experience. A cantilevered roof lets light filter through the dragon-like scales or glass spandrels of the underlying structure, and looking through the towering glass facade affords insiders expansive views of the Tonle Sap and Mekong Rivers. Lighting will be optimized at 400 lux - the same amount of light as a sunrise or sunset on a clear day, and air will be conditioned through a central chiller VAV system, which could be modeled to provide energy savings of 10% to 20% of HVAC energy costs. The building will be secured with card access, advanced CCTV, and turnstile control. An exterior curtain wall will be constructed with low-energy insulated glazing for additional efficiency and interior climate preservation.